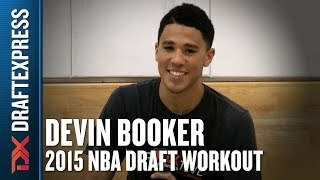 An interview with Kentucky shooting guard Devin Booker featuring footage from his pre-draft workouts in Los Angeles with Don MacLean. The son of Missouri great Melvin Booker (an outstanding player for many years in Europe), Devin Booker played an important role for Kentucky despite only turning 18 less than two weeks before the regular season kicked off. Playing for a team that struggled with floor-spacing due to starting three power forward/centers at the same time, Booker was the designated marksman who came off the bench for 21 minutes per game on average, and gave Kentucky's offense some much needed outside shooting and scoring efficiency (53% 2P%, 41% 3P%, 83% FT%). Booker has solid height for a shooting guard at 6-6 in shoes, as well as a strong build, but doesn't possess a very long wingspan (6-6) or incredible explosiveness. He's a fluid athlete who moves well and has decent quickness, but isn't the type of prospect who will be jumping over or dominating other players physically. Nearly half of Booker's field goal attempts on the season came from beyond the arc, and for good reason, as he is one of the best shooters in this draft class. He has gorgeous shooting mechanics, a quick, compact and repeatable motion complete with an effortless release and textbook follow-through. His size, high release point and ability to create separation off the dribble makes him a very capable off the dribble shooter. He has outstanding footwork and balance, allowing him to be more than just a spot-up floor-spacer as someone who makes shots running off screens, attacking closeouts, and punishing defenders for going underneath on the pick and roll. He already shows range out to the NBA 3-point line, and hit 41% of his shots beyond the arc on a very high volume of attempts per-minute. Booker is a very intelligent prospect, showing impressive maturity and fundamentals despite being the youngest player in this draft class. He moves off the ball well and passes the ball unselfishly, often making the extra pass along the perimeter and cutting smartly as the defense rotates. He's not a flashy or high-volume shot-creator for himself or others, but will certainly make teammates better with his ability to keep the defense honest and force opponents to account for where he is on the court at all times. He doesn't take bad shots, and rarely turns the ball over, averaging just one turnover per-40 minutes, with a 10% turnover percentage that ranks among the lowest rates in this draft. Defensively, Booker's strong frame and competitive nature means he is unlikely to emerge as a liability on this end of the floor. He fights over screens, and shows excellent technique and fundamentals, rarely getting pushed around, despite his youth. With that said, his lack of length and reach, combined with his average lateral quickness, does raise some concerns. He struggles to contest jump-shots closing out on the perimeter, and will get beat at times off the dribble. Additionally, he averaged one of the lowest number of blocks, steals and rebounds of any player in this draft on a per-minute basis, which is a red-flag statistically that again points towards a distinct lack of upside on this end of the court. The number of players in the NBA who aren't point guards and possess a wingspan shorter than 6-6 and a standing reach under 8-4 is fairly small: J.J. Redick, O.J. Mayo, Kirk Hinrich, Marcus Thornton, Jody Meeks, Gary Harris, Randy Foye. It's unlikely he'll ever be asked to guard more than one position, which limits his versatility somewhat. There are also some question marks about Booker's ball-handling ability and how prolific of a shot-creator he will become at the NBA level. Most 3-pointers in today's NBA game come off an assist, and to fully take advantage of Booker's terrific stroke, he will have to be on a team that can manufacture good looks for him. Booker mostly stayed in his lane at Kentucky and played the role he was asked to, which is likely similar to what he will do in the NBA. He was only charted for four isolation possessions all season at Kentucky, and is unlikely to be someone that is asked to shoulder a very heavy load offensively at the next level either. 178 of the 200 shots Booker took in the half-court were jump-shots this season. In the rare cases that he does get inside the paint, he is not a great finisher, due to his average explosiveness and the lack of extension he gets around the rim due to his poor wingspan. He relies heavily on pull-up jumpers and floaters once he puts the ball on the floor, which are not the most high percentage looks in the NBA, and rarely gets to the free throw lineonly 65 times in 38 games this season. NBA teams in the lottery are usually hoping to find a player who projects as either a lockdown defender, or a prolific scoring optionwhich Booker is neither as of right now. With that said, the shooting guard position lacks quite a bit of depth in this draft class and in the NBA as a whole right now, and there's never been a higher premium put on floor-spacing and 3-point shooters. While Booker may not possess superstar potential, he also comes with very little risk, as it will be very very surprising if he doesn't end up developing into at least a solid NBA player. At age 18, as the youngest player who will hear his name called on draft night, and someone who is younger than many of the players who participated in this year's McDonald's All-American game, there is plenty of room for him to continue to improve despite not possessing incredible physical tools or upside.